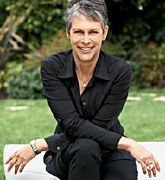 Jamie Lee Curtis says she embraces getting older: “I actually think there’s an incredible amount of self-knowledge that comes with getting older. I feel way better now than I did when I was 20. I’m stronger, I’m smarter in every way, I’m so much less crazy than I was then. “Years ago my husband and I were at the Golden Globes. I was wearing some borrowed dress that wasn’t me, my hair was done in a way that I never wear my hair, and I had earrings on. “And my husband said, ‘You know who is the most beautiful woman in the room?’ And I was hoping he was going to say me. And he pointed across the room at Jessica Tandy. She was sitting at a table wearing a cream-colored silk-shantung pantsuit. Single strand of pearls, short white hair, a little lipstick—nothing else. And I thought, ‘He’s totally right.’ There was none of the pretense, none of the trying so hard. “My style is a distillation. I’ve etched out who I am through myriad haircut attempts, outfit attempts, beauty attempts, diet attempts. It’s been an evolution. I’ve let my hair go gray. I wear only black and white. Every year I buy three or four black dresses that I just keep in rotation. I own one pair of blue jeans. I’ve given away all my jewelry, because I don’t wear it. 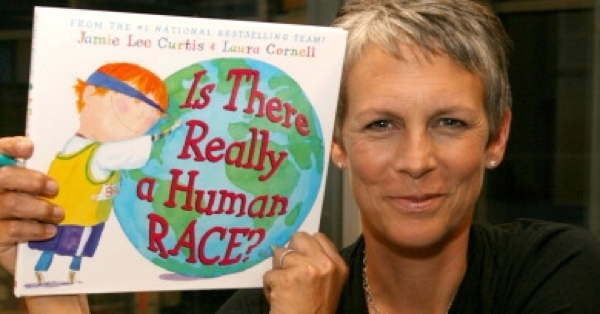 In addition to acting, Curtis expresses her creative talents by writing books for children. One of her titles is Today I Feel Silly and Other Moods That Make My Day. Actor Tyne Daly [left, with her “Judging Amy” costar Amy Brenneman] has commented about aging as a way to grow and change: “I feel less obliged to protect any made-up version of myself. When you’re young, you want to make a good impression in Hollywood. But I’ve kind of moved on from caring very much about other peoples’ judgments of me.” [From my article Maturity and Creativity. Also see more quotes on the page: maturity.